View More In Seat & Roller Bar Covers. DESIGNED TO FIT MOST KNEE WALKERS like Knee Rover, Drive Medical DV8, Roscoe Knee Scooter (knee walker sold separately). MAXIMUM COMFORT: Soft and cozy sheepette fleece cover provides extra cushion while distributing pressure evenly across knee pad platform. If you are recovering from a broken foot, broken ankle, broken leg, foot surgery, ankle surgery or other lower leg injuries or medical conditions like ulcers, the Knee Rover Sheepette Knee Pad Cover is a MUST! PROTECTION & RELIEF: Helps reduce pressure, friction, and skin irritation; while reducing everyday wear and tear on the knee pad. EASY TO INSTALL: Stretchable elastic securely fits over knee pad for superior comfort and better air circulation. EASY CARE: Machine Washable cover is easy to clean - simply remove cover and put in washing machine and fluff dry. NEED MORE ACCESSORIES OR PARTS FOR YOUR KNEE WALKER? 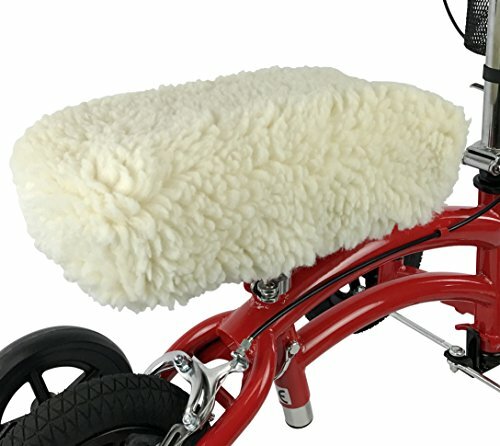 When considering an accessory or part for your knee walker scooter, check out the full line of KneeRover accessories available on Amazon - including Knee Walker Backpacks, Sheepette and Memory Foam knee pad covers, cup holder, LED head light, baskets. Save even more with KneeRover accessory kits. If you have any questions about this product by KneeRover, contact us by completing and submitting the form below. If you are looking for a specif part number, please include it with your message.